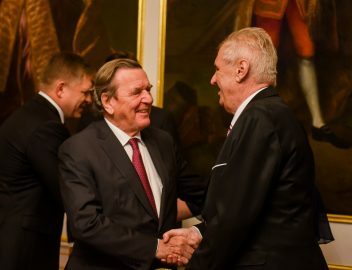 Major international challenges, including the fight against terrorism, conflicts in the former Yugoslavia, the Iraq War, and European unification, framed the foreign and security policy of Gerhard Schröder’s chancellorship. During this time, Germany was a key voice in European and transatlantic politics. It assumed more international responsibility, helping to bring peaceful resolution to conflicts abroad, yet it also contributed military forces to secure peace when necessary. 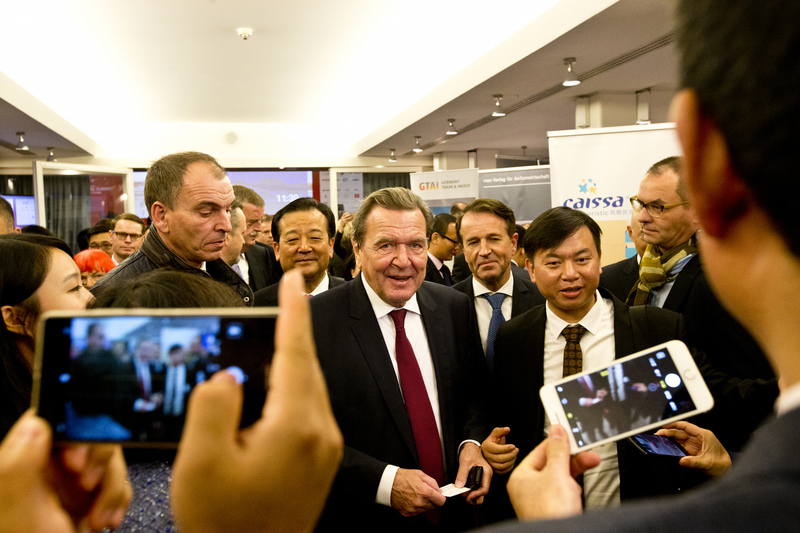 Schröder was guided by the principle that Germany must make its own foreign policy decisions. Therefore, when the arguments for invading Iraq put forward by the U.S. and its allies left Schröder unconvinced, he ruled out Germany’s involvement. In other areas of international politics, Germany pushed for a stronger United Nations, championed more fair and sustainable forms of globalization, and worked to fortify and expand the European Union. 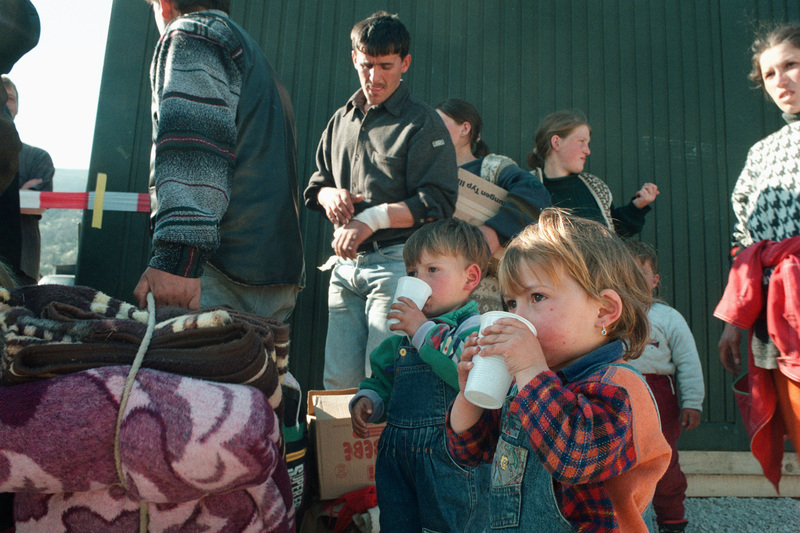 Children from Kosovo arriving in a refugee champ of the german army, Tetovo, Macedonia. The Kosovo conflict of 1998–99 created hundreds of thousands of refugees. NATO intervened militarily in order to prevent a humanitarian catastrophe. It was the first time the German army had been sent on a combat mission since the end of the Second World War (photo credit: Marco Urban). In the years immediately following German reunification, Germany was hesitant to exercise its newly gained sovereignty on the international stage, such as with UN-mandated military deployments. International observers characterized Germany’s passive stance as “checkbook diplomacy.” The turning point for German foreign policy and security policy came in 1998–1999, during the conflict in the former Serbian province of Kosovo. The war led to massive human rights violations as well as the displacement of hundreds of thousands of Kosovo Albanians. On 24 March 1999, Germany participated in a NATO operation to prevent a humanitarian catastrophe and reinstate peace. The operation was controversial among German politicians because it lacked a mandate from the United Nations. For the first time in Germany’s postwar history, a Chancellor decided to deploy the Bundeswehr on a combat mission. In 1999 Schröder used his position as president of the EU Council and member of the G8 to initiate a peaceful end to the conflict. The military operation ended in June of 1999. Afterward the United Nations sent a peacekeeping force made up of soldiers from Germany and many other nations to Kosovo. Since the Kosovo conflict, the Bundeswehr has taken a more active role in international military operations – a sign of Germany’s increased sense of global responsibility. 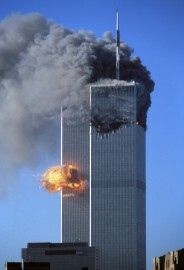 The war against terrorism became the dominant issue in world politics following the September 11 attacks. Germany participated in the NATO mission to Afghanistan (photo: DPA). 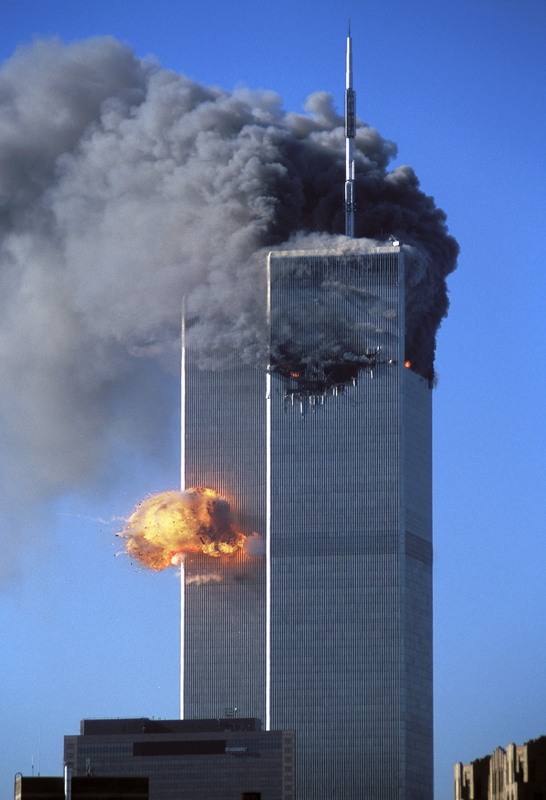 On 11 September 2001, the terror network Al-Qaeda attacked the United States, killing almost 3,000 people. The attacks led to a turning point in international politics, placing the fight against international terrorism at the forefront. For the first time in the history of NATO, Article V was invoked, demanding the military aid of all members. 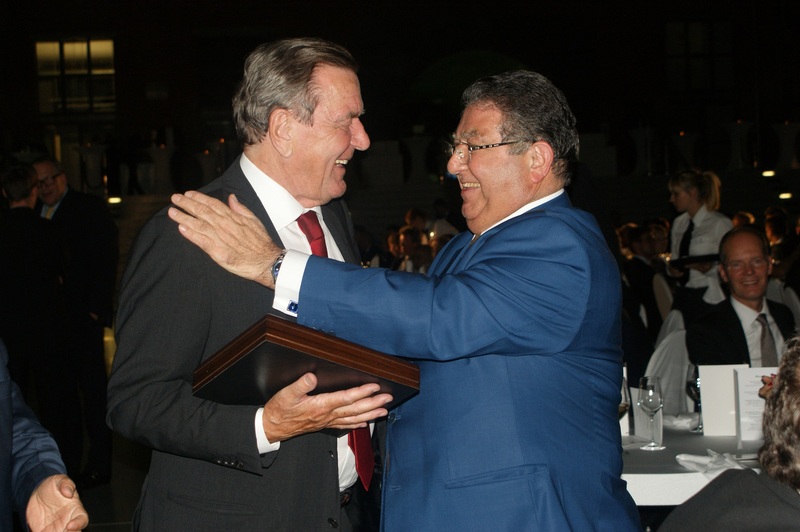 Gerhard Schröder promised the United Stated “unconditional solidarity,” but added that German would not support reckless military escapades. On 7 October 2001, the United States began an attack on Afghanistan in an effort to topple the Taliban regime and to fight Al-Qaeda. The following December, as part of its fight against international terrorism, the United Nations established in Afghanistan an International Security Assistance Force (ISAF) that included Germany’s armed forces. Schröder succeeded in getting a mandate at home for deployment by linking the decision with a vote of confidence in German parliament. While hosting the first International Conference on Afghanistan, which took place in Bonn in 2001, Germany started an initiative to create a transitional government and raise international support for the country’s reconstruction. Germany is scheduled to withdraw its forces in Afghanistan in 2014. In order to prevent the invasion of Iraq, Germany allied itself with France and Russia, both of which possess veto power on the UN Security Council. 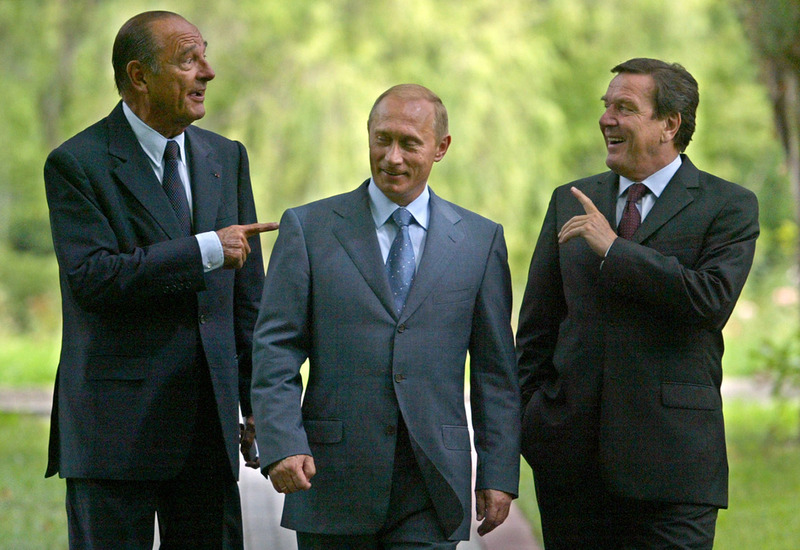 Close collaboration took place between French President Chirac (left), Russian President Putin (center), and Chancellor Schröder. The above image is from a meeting in 2004 (photo: DPA). In the summer of 2002 Gerhard Schröder announced that under his leadership, Germany would not participate in the Iraq War. He was not persuaded by the shifting justifications for war offered by the U.S. government, which included the supposed existence of weapons of mass destruction. Remaining steadfast in his “no” to the war, Schröder formed an alliance with French President Chirac and Russian President Putin. Although the majority of Europeans rejected the war, governments were unable to agree on a common stance. In a public declaration, state and government leaders from Spain, Portugal, Italy, the United Kingdom, the Czech Republic, Hungary, Poland, and Denmark announced their support for the war, while the opposition party in German parliament, under the leadership of Angela Merkel, expressed openness to Germany’s involvement. On 20 March 2003 the United States and the “coalition of the willing” invaded Iraq, intent on overthrowing Saddam Hussein’s regime. The last remaining U.S. troops were not withdrawn until 2011; no weapons of mass destruction were ever found. According to independent estimates, at least 100,000 people died in the Iraq War and the sectarian violence that followed it. The Minister Presidents of the Czech Republic (Spidla; left) and Poland (Miller; second from right) meet with Chancellor Schröder and EU Commissioner Verheugen (right) to celebrate the accession of several Eastern Europe states to the EU (photo: Marco Urban). 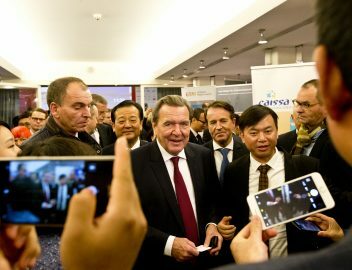 Beginning with his presidency of the EU Council, in 1999, Gerhard Schröder focused Germany’s European policy on overcoming the historical divide between the eastern and western parts of the continent. With the fall of the Iron Curtain in 1989–90, Eastern European states had regained freedom and sovereignty but remained outside the European Union. Membership negotiations that began in 1997 were still not complete. 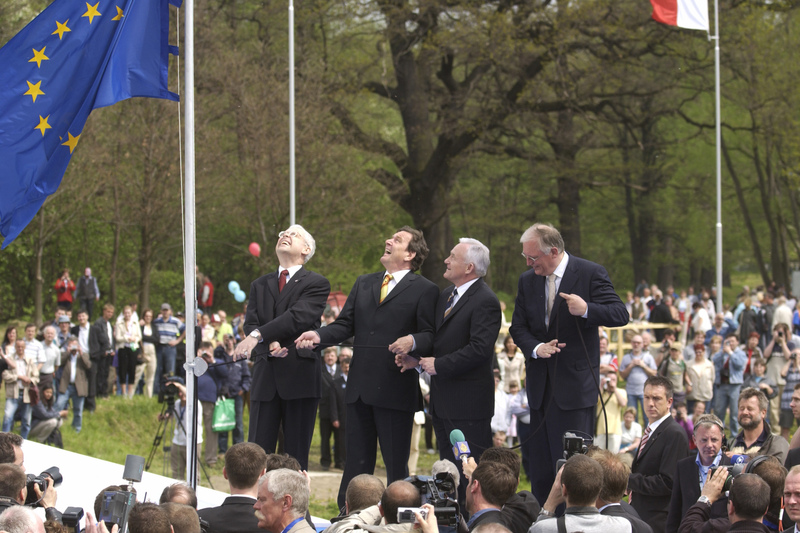 At the 2002 EU summit in Copenhagen, Germany helped pave the way for the accession of eight Eastern European states as well as Cyprus and Malta on 1 May 2004. It was the largest expansion in the history of the European Union. The prospect of admission was also extended to Turkey and the Balkan states. 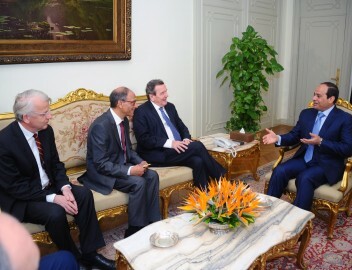 Gerhard Schröder gave strong support to Turkey’s candidacy, helping to kickstart membership negotiations in 2005. 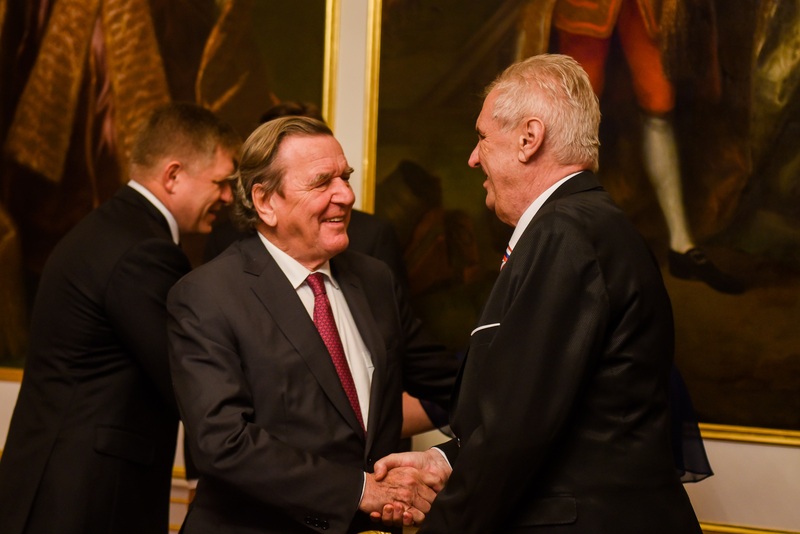 Schröder’s chancellorship lent new momentum to other areas of Eastern European policy as well. He forged strategic partnerships to expand cultural, economic, and political relations between Europe and Russia, which has helped to ensure peace and stability while also facilitating difficult political processes, such as the expansion of NATO and the EU to Russia’s borders. 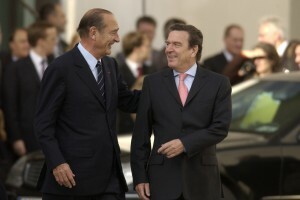 French President Chirac and Chancellor Schröder (shown here in Berlin in 2004) both viewed close German and French cooperation as a key driver of European consensus (photo: Marco Urban). To prepare the European Union for Eastern European expansion, European institutions and treaties had to be reformed at the beginning of the new millennium. Playing an important role in the process were the strong relations between France and Germany, especially the close cooperation between President Chirac and the Chancellor Schröder. Both states saw themselves as the motor behind European unification and deepening ties among the member states. After the Treaty of Nice was adopted in 2000, Chirac and Schröder spearheaded new measures to strengthen Europe’s political union. A European convention was convened to draft a European constitution. The draft was rejected by national referendums in France and the Netherlands, though parts of the draft found their way into the Treaty of Lisbon in 2007. The adoption of various provisions, such as the Charter of Fundamental Rights, has helped to empower the EU and make it more democratic. The cooperation between France and Germany found expression in a historically unique gesture: at the 2004 EU summit, President Chirac cast Germany’s ballet while serving as proxy for Chancellor Schröder, who had to be in Berlin for a vote at the Bundestag. The politicians also initiated the Blaesheim process, a series of informal meetings named after a commune in Alsace. Held alternatively in Germany and France, the meetings are used by the French President and German Chancellor to reach agreements before EU summits. On the 40th anniversary of the signing of the Élysée Treaty, they declared January 22 to be the day of French-German friendship. Chancellor Schröder and Kofi Annan, UN General Secretary (Berlin, 03 July 2000). During Schröder’s chancellorship, Germany advocated the reform of the UN as well as a greater voice for developing nations (photo: Marco Urban). 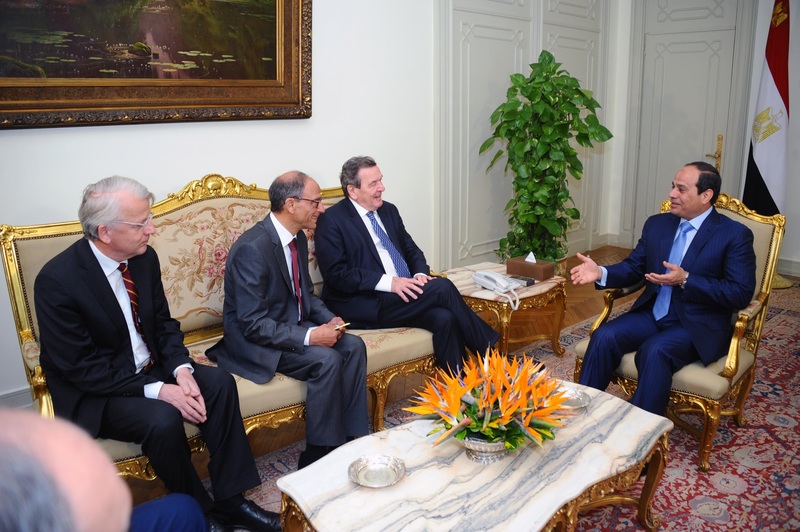 Gerhard Schröder’s administration sought to strengthen the United Nations, helping ensure multilateral resolutions to global challenges. 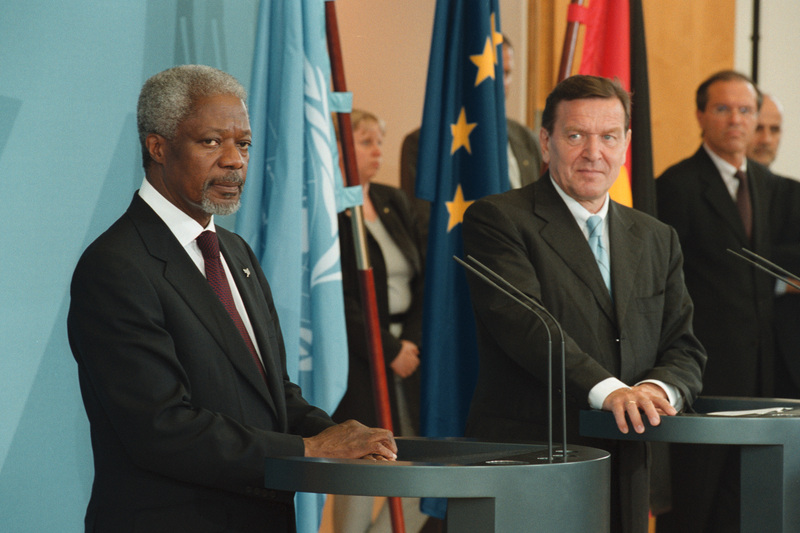 At the UN Millennium Summit in 2000, Germany promised to make a significant contribution to the global fight against poverty, hunger, and environmental pollution. To these ends, Germany initiated a step-by-step plan for the EU to increase funds for development assistance, and in 1999 initiated an international program at the Cologne G8 summit to forgive the debt of more than thirty of the world’s poorest countries, freeing up funds for investment in social and educational programs. The Renewables conference, which took place in Bonn in 2004, advocated the international expansion of green power in an effort to slow climate change. Germany campaigned for fair access to global markets for developing countries and for reforms to the World Bank and the IMF aiding sustainable global development. Schröder also called for the increased involvement of developing countries. 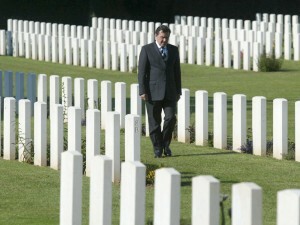 Chancellor Schröder commemorates the dead of the Second World War with a visit to a cemetery in Ranville, France, on the 60th anniversary of D-Day (photo: DPA). Like past Chancellors, Gerhard Schröder worked to ensure that Germany remains aware of its historical responsibility and continues to inform later generations about the crimes committed by Adolf Hitler and the National Socialists.. One of Schröder’s central projects was the establishment of the Foundation “Remembrance, Responsibility, Future”, which compensated more than 1.6 million former slave and forced workers for the extreme suffering they endured in Hitler’s Germany. In 1999 the Bundestag resolved to erect a memorial in Berlin to the murdered Jews of Europe; the monument and its information center opened six years later. Gerhard Schröder represented Germany at the 2000 International Holocaust Conference in Stockholm, in which 40 nations promised to keep the memory of the Holocaust alive and to continue to fight antisemitism and racism. In 2001 the Jewish Museum in Berlin was opened and made a federal foundation. On 27 January 2003 – the memorial day for the victims of National Socialism – Schröder signed a historic treaty with the Central Council of Jews in Germany, who pronounced it to be an extremely significant expression of Jewish confidence in Germany’s society and democracy. 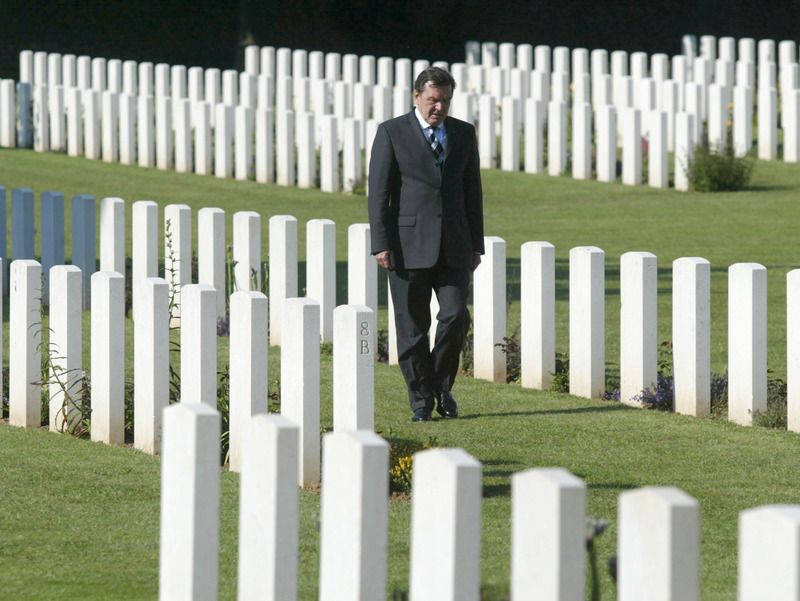 In 2004 and 2005 – 60 years after the end of Second World War – Schröder represented Germany at a number of remembrance days abroad, including events commemorating the Allied landing in Normandy, the liberation of Buchenwald, the Warsaw Uprising, and the official end of the war. Speech by Gerhard Schröder on the 60th anniversary of the liberation of the Nazi concentration camps from 10 April 2005. Chancellor Schröder meets the “women of Srebrenica” – survivors of the massacre that occurred there – in 2005. The failure of the international community to prevent the massacre was a reason for the military intervention that took place in 1998 (photo credit: DPA). During Schröder’s chancellorship German foreign policy championed the peaceful and multilateral resolution of international conflicts and sought to strengthen the United Nations, international law, and human rights. Schröder’s administration established the first-ever committee for human rights in the Bundestag, founded the German Institute for Human Rights, established a human rights officer at Germany’s Foreign Office, and submitted a national plan for human rights. Internationally, the federal government actively supported reforms to the United Nations aimed at providing fairer representation among its members, especially developing countries. Germany also pushed for the consistent prosecution of international law violations, advocated the creation of an International Criminal Court, and showed its willingness to intervene militarily when it came to protecting human rights, as in Kosovo. In its bilateral relations Germany created institutions to help strengthen democratic ideas and actions, such as the Rule of Law Dialogue it started with China in 1999.